The weather’s warm, and tomatoes are ripe for the picking! Field tomatoes or tomatoes grown outside in the field are in season July – September in Ontario & Quebec. Take tomatoes for example. Tomatoes are rich in lycopene, one of the most powerful antioxidants. 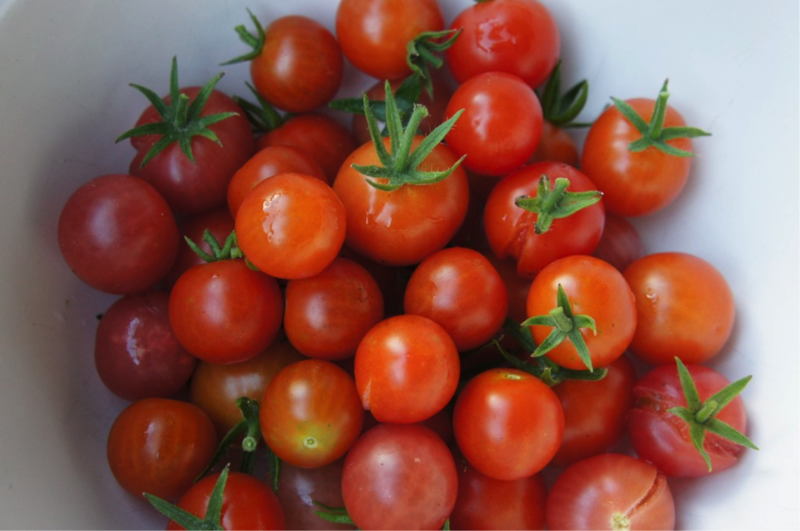 Not only does lycopene have cancer-fighting properties, it’s also known to protect our skin from the sun’s harmful UV rays & protect against sunburn – the perfect vegetable to eat in the summer! Another awesome fact about tomatoes; cooking them enhances their nutritional value by increasing their antioxidant power. This is great news from a health perspective, and a chef’s perspective because there are so many awesome ways to cook tomatoes! First, marinate them in a delicious blend of olive oil, balsamic vinegar, garlic and chili flakes. Then, roast them for 25 minutes at 400 degrees fahrenheit. They smell amazing, and pair perfectly as a sauce for your favorite pasta (as a nutritionist I would recommend brown rice, whole-wheat, quinoa or lentil pasta). No need for store-bought tomato sauce when you can make your own – check out my famous Roasted Cherry Tomato Pasta recipe, and take advantage of the health benefits and flavor of oven-roasted tomatoes!